Biskit the GSD / Beagle mix at 2 years old—"Biskit is a very active dog. She runs around a lot in the backyard like she is still a puppy. She likes to chew on stuff even with her chew toys. She is good at annual checkups. She smiles with her teeth sometimes. It looks mean but she isn't. She doesn't like cats. She doesn't like to be left alone for long periods at a time, which is like 2 hours." The Beagle Shepherd is not a purebred dog. It is a cross between the Beagle and the German Shepherd. The best way to determine the temperament of a mixed breed is to look up all breeds in the cross and know you can get any combination of any of the characteristics found in either breed. Not all of these designer hybrid dogs being bred are 50% purebred to 50% purebred. It is very common for breeders to breed multi-generation crosses. 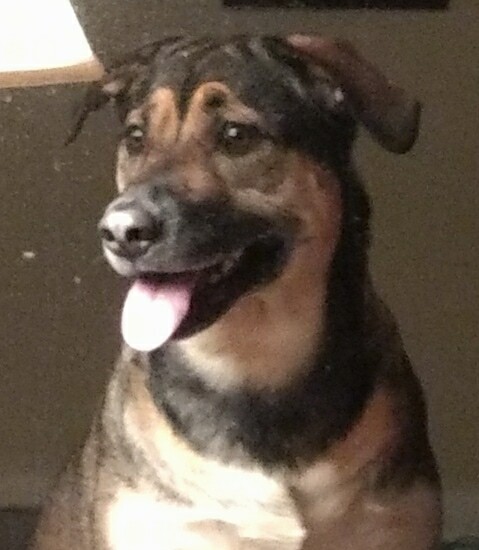 "This is my Beagle/German Shepherd mix, Diesel! 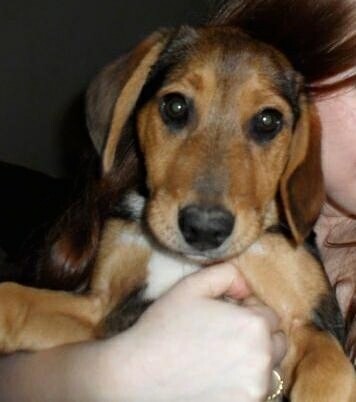 He was a puppy in this pic. When he was 9 and a half months old he weighed fifty pounds and at that age standing up his paws were at my chest, but I'm only 5'1 so that's not saying much. He's great with kids and other dogs, though a male dog is harder for him than a female. I can't find much information on this hybrid, but he is an amazing dog. He is sweet, protective and very goofy! He is easy to train, but he won't do much without treats yet. He is very active, but he'll play till he's completely worn out, then he can sleep forever. He doesn't howl but every once in a blue moon, and seems to take after the German Shepherd more, though he's got the telltale floppy ears. I wish I knew how big he will get, I figure no more than sixty pounds though!"